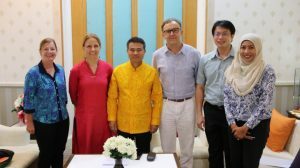 The Phuket Hotels Association has joined forces with the U.S. Embassy Science Fellowship (ESF) Program to tackle the critical issue of waste management in Phuket, with the aim of eliminating single-use plastics at the island’s hotels. Founded in 2001, the ESF Program promotes bilateral cooperation in the fields of science and technology. Since it was launched, nearly 300 scientists have provided their expertise to projects around the world. Under the latest project, Dr. Marissa Jablonski, an appointed Fellow of the program, will conduct a 60-day research project in Phuket, beginning July 2, 2018. Using the latest technology and data collection tools, she will investigate plastic use and waste management at the island’s hotels and resorts. At the end of her assignment, Dr. Jablonski will create a final report detailing recommendations for the elimination of single-use plastics at all Phuket hotels and resorts. While Thailand is only the 20th most populous country in the world, it is believed to be among the top six plastic polluters. If urgent action isn’t taken, there could be more plastic than fish in the world’s oceans by 2050. This would have a devastating impact on marine environments and food chains. Reducing plastic is one of the Phuket Hotels Association’s primary goals. It has already set up a working group dedicated to eliminating plastic water bottles in hotel rooms and reducing other single-use plastics within the hotels, such as drinking straws. The Phuket Hotels Association also conducts regular beach clean-up events and hosts staff training and education workshops on the negative impact of plastic on the environment. To facilitate this, the Phuket Hotels Association has even translated and created Thai subtitles for the documentary “A Plastic Ocean,” in partnership with the Plastic Oceans Foundation. Teaming up with the ESF Program marks the next major step in the association’s efforts to tackle plastic pollution. Dr. Jablonski is an expert in her field and will work alongside the Phuket Hotels Association, member hotels, and local authorities to analyze and evaluate waste management at hotels and resorts across the island. She will also seek to raise awareness within the community about marine plastic pollution, including educational visits to local schools. Once Dr. Jablonski’s recommendations are implemented at all 70+ Phuket Hotels Association’s member properties, Phuket will become one of the first tourism destinations in the world to eliminate single-use plastics across such a large number of hotels and resorts.